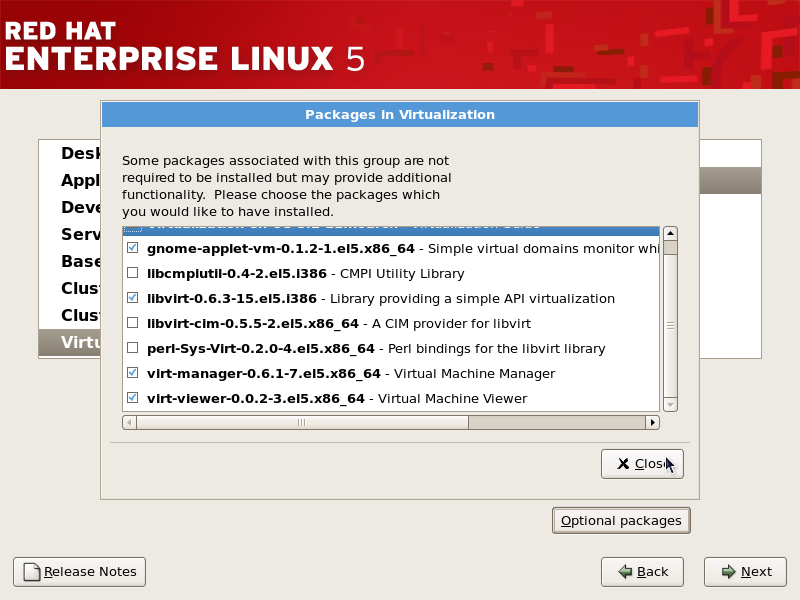 Before you can use virtualization, the virtualization packages must be installed on Red Hat Enterprise Linux. These can be installed either during installation, or after installation using the yum command. You can install both the KVM and Xen hypervisors on a single system. The Xen hypervisor uses the kernel-xen package and the KVM hypervisor uses the default Red Hat Enterprise Linux kernel with the kvm kernel module. Xen and KVM each use a different kernel and only one hypervisor can be active at any given time. To change hypervisor from Xen to KVM or KVM to Xen, see Section 33.2, “Changing between the KVM and Xen hypervisors”. This section covers installing Xen packages and virtualization tools on a new Red Hat Enterprise Linux installation. 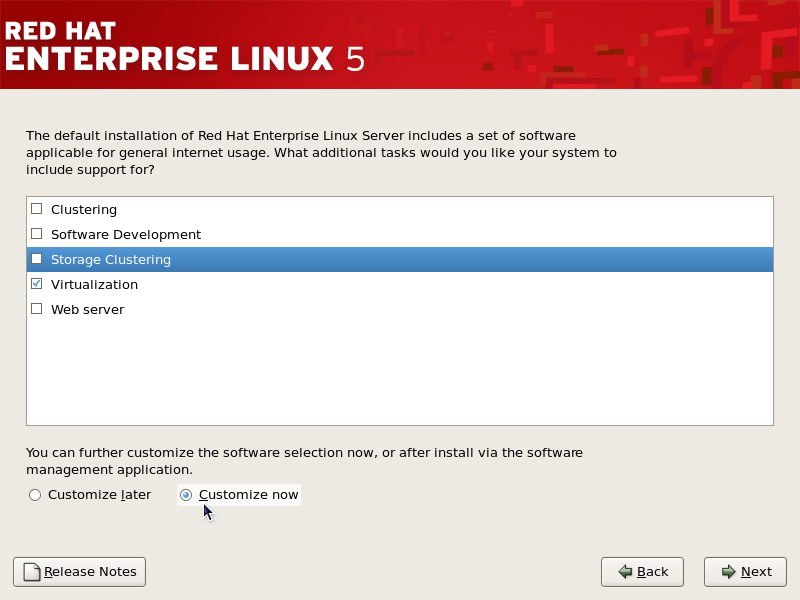 The Installation Guide (available from access.redhat.com) details the installation of Red Hat Enterprise Linux. You must enter a valid installation number when prompted to receive access to the virtualization packages. Installation numbers can be obtained from Red Hat Customer Service. Complete all steps until you see the package selection step. Select the Virtualization package group. The Virtualization package group selects the Xen hypervisor, virt-manager, libvirt and virt-viewer and all dependencies for installation. You require a valid Red Hat account with the virtualization entitlement to receive updates for the virtualization packages. This section describes how to use a Kickstart file to install Red Hat Enterprise Linux with the Xen hypervisor packages. Kickstart files allow for large, automated installations without a user manually installing each individual system. 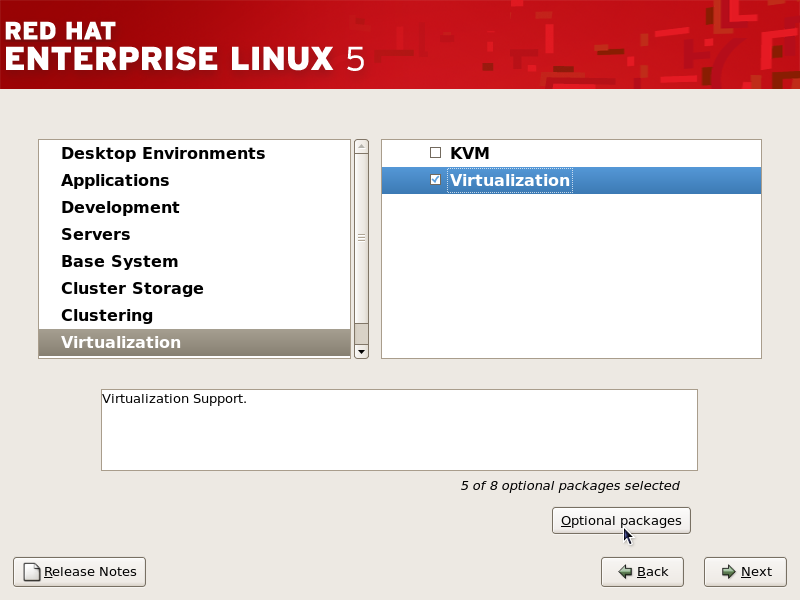 The steps in this section will assist you in creating and using a Kickstart file to install Red Hat Enterprise Linux with the virtualization packages.